So what’s the best way to discover customer motivations? How do you understand how customers feel and think? How can you probe the emotional aspects of a user’s task? These are all different questions with different goals. Here’s how you can decide what research to do in each case. 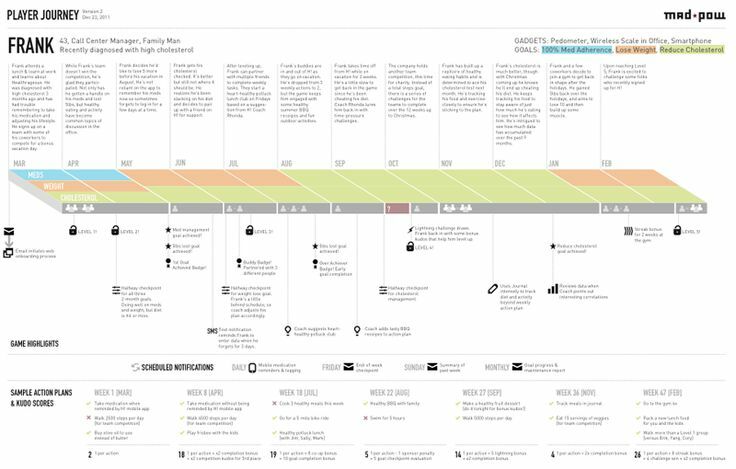 Customer journey maps are hot right now. 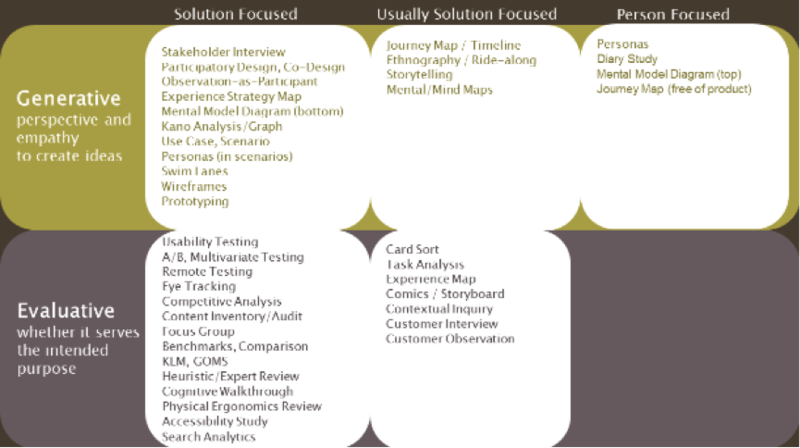 Journey maps usually result in appealing and informative diagrams, but if someone in your organization wants to do this kind of research, make sure he or she understands what kind of goal it serves. A customer journey map is about a particular persona type having a particular experience. Particular persona type means that you match a researched-and-well-defined audience segment to a behavioral area. For example, you might choose the, “I need a pick-me-up, so I do a little retail-therapy shopping” audience segment for the “shop for fashion” behavioral area. Another example is the, “nearly professional hobbyist photographer artist” within the “decide whether to buy new gear” behavioral area. Particular experience means a defined scope that your organization would like to improve, but which is translated to the customer’s perspective. For example, it could be the “select the right product for my situation” scope, or the “track my shipment” or “unboxing” scopes. It could even be the, “decide I need a new _____” scope. If your colleague wants to learn about the experiences of online shoppers on your ecommerce site, you need to be able to recognize what goal this represents. It’s all in the wording. When you hear or say words that identify someone as a person using your service or product, for example “shopper”, then you know that your goal is to understand how well your solution (or idea) will support that person. You can call these goals solution-focused. On the other hand, when you use a word that does not define the way a person interacts with your organization, for example “person” or “human,” then your goal is to understand that person’s mind and heart. Call these goals person-focused. If you can be deliberate about the wording of your goal, you can be clear about which research method to use to reach that goal. generate new improvements or new ideas. These are called “evaluative” and “generative” research respectively. When you make a matrix from these two research usage goals and the two internal research goals above, then you can see which methods best support the union of your particular goal at the moment. For example, the customer journey map can help you define new ideas to support the customer so it is considered generative. And because you are using the word “customer,” it is solution-focused. Sometimes professionals use the customer journey map in an evaluative manner, but that is less common. Clarity about which methods support which of your goals makes it easier for you to know what to do. For example, Steve Portigal’s book Interviewing Users describes the solution-focused user interview. Aga Bojko’s book Eye Tracking covers this type of evaluative, solution-focused research. Indi Young’s book Practical Empathy defines how to develop empathy for generative, person-focused work. Many UX professionals accidentally fall into this trap. They may categorize results into three stages: before purchase, during purchase and after purchase. The danger here is that thought processes and emotions do not necessarily span all three of these pre-defined categories. This example would be better approached with a single scope from the customer’s point of view, such as “select the right product for my situation.” During a research session with a customer, inevitably the story you hear will hop back-and-forth and intertwine all of your pre-defined stages. Instead of trying to artificially separate them out, concentrate on different themes that the story brings out. For example, you could look for emotions like doubt, distrust, excitement, impatience, or behaviours such as asking friends, looking for advice, deciding based on gut, knowing from past experience, etc. These elements will end up defining your categories if you see them appear as patterns across customers. So give your research goal some love. Analyse what it is you are doing and who you are doing it for. Don’t simply choose the most popular method-du-jour, or your research goal may end up in a corner, the shiny toy that isn’t useful and is never played with. Indi’s new book Practical Empathy defines how to develop empathy for generative, person-focused work. Indi Young is an independent consultant. She helps teams with person-focused research, design strategy, interaction flow, communications, and information architecture. She has been a trailblazer of experience design since the dot-com boom, using her roots in computer science to help people adopt a neutral, well-considered mindset. In 2001 she founded Adaptive Path, the San Francisco experience design agency. In 2008, her book introducing mental model diagrams was published. She writes articles, conducts workshops and webinars, and speaks about the importance of pushing the boundaries of your perspective.